Lydia Owen's Art Studio 17 in Columbia, SC offers fun and educational art classes and camps throughout the year for kindergarten -12th grade. Classes are offered once a month. Summer camps are also available. "Art After School" — Fine art classes after school at five locations in Richland District 2 focus on learning the fundamentals of art and experimenting with various mediums in painting, sculpting, printmaking and drawing. All classes held at Hobby Lobby stores. Art After School at Lake Carolina's Lower Campus is a fun and creative outlet for your little budding Picasso! For students in grades K-5 - 2nd grade. Offers in-store classes and online Craftsy classes. Northeast Arts Academy provides art education for all ages, inspiring each person to develop his or her talents for the glory of God! Northeast Arts Academy promotes excellence in the arts within Northeast Presbyterian Church and the community. Qualified faculty artistically and spiritually train students in a safe, Christian learning environment. Students are equipped to serve musically and artistically within church, personal, and performance settings, enabling them to become an integral part of the worship services at their respective church. Private and group instruction is open to anyone in the community who has a desire to study one (or several!) of the arts. There are no entrance requirements, and students of all ages are welcome. Our faculty works with students just beginning their study to those who are already experienced in their chosen discipline. Sign up for their newsletter for info. on glass-blowing workshops for kids and adults. Homeschool community garden and bookstore. HERS, Home Educators Resource Sale, is an annual used book sale hosted by REACH. It is free and open to the public and is a great way to either clean out your old curriculum or find something for the next year. Come join us and see what is to be offered. The Carolina Cup race-meeting is a time honored South Carolina tradition that has achieved premier social event status. The annual 'rites of spring' draws over 65,000 fans from throughout the southeast, to enjoy the thrilling sport of steeplechase horse racing amid a flurry of spring fashions and elaborate tailgate parties. Clean Sweep is Columbia's best, one-day rummage sale held in the Cantey Building at the South Carolina State Fairgrounds each winter. Featuring music, food, souvenirs and performing arts of the various cultures, nationalities, races and language groups represented in South Carolina. Takes place at the State Fairgrounds. More than a festival, iMAGINE Upstate fueled by ScanSource was an all access pass to drones, battling robots, racecars, 3d printing, hovercrafts and more! Open Tuesdays from 2:00-7:00 p.m. across from the Village at Sandhill. In appreciation for their service to our country and its citizens, active and retired military personnel and their dependents with proper military photo ID admitted free the entire 12 days of the fair. Join us each day at 12:00 noon as we salute our military and the USA in a patriotic flag-raising ceremony near the South Gate. Monday-Saturday, 6 a.m. to 9 p.m., Sunday, 12 p.m. to 6 p.m. Arrows Academy was developed by 3 homeschool moms who desired more educational opportunities for their children. They desired a school that would combine the best of both the traditional brick and mortar classroom and homeschooling. And as moms, they desired more time, support, and encouragement for themselves. They wanted teachers who shared their biblical values and would instruct their children’s hearts as well as their minds. Arrows Academy Core program was developed to hold classes on Tuesdays and Wednesdays that would cover a variety of subjects, freeing parents from having to “teach” these subjects at home. For these Core classes, the students would have assignments to complete at home the rest of the week under parental supervision. Parents would then instruct their students in the subjects of math, spelling, and grammar to complete a well-rounded curriculum. Classical Conversations, Inc., is a nationwide program that supports homeschooling parents by cultivating the love of learning through a Christian worldview in fellowship with other families. We believe there are three keys to a great education: classical, Christian, and Community. There are five licensed Classical Conversations communities less than ten miles from Fort Jackson (in Northeast Columbia, the downtown area, the St. Andrews area, and West Columbia). You can find others in the greater Columbia area at https://www.classicalconversations.com/find-community. We have weekly classes for age 4 through high school. Foundations programs (ages 4-11) generally meet from 9 a.m. – noon, Essentials (ages 9 – 11) from 1 – 3 p.m.; Challenge (ages 12 and up) programs go for a full day, often from 8:30 a.m. to 3:30 p.m. Foundations work includes memory work in history, science, math, English grammar, geography and Latin, science experiments, fine arts, student presentations. Essentials covers English grammar and structure, writing, and mathematics. Challenge offers a full college prep program. Parents receive free training at annual Parent Practicums and through webinars and other events offered throughout the year. For more information and to contact a director, see www.classicalconversations.com/find-community. Excelsior is a family-oriented Christian resource used in tandem with homeschooling. We are privileged to assist home schooling families in the Midlands as they direct the education of their students. We hope you’ll consider joining this committed community of teachers, parents, and students. We offer classes from four years of age through high school. We offer strong academic instruction, and also have times for your student to build relationships inside and outside of the classroom. The Academy classes, ages 4-13, will develop an effective Christian worldview as they study history, literature, foreign language, art, and optional electives. Academy students will be involved in monthly field trips and a service project each semester. All of our High School offerings are college-preparatory classes with honors options which must be declared at the beginning of the school year. High school students are able to take part in monthly socials, occasional service projects, and an annual spring formal. Classes are held at First Baptist Church of West Columbia. The Principia Center is a resource center for homeschool families in Columbia, SC. We provide weekly instruction for students in grades 7-12. Our courses meet Mondays for a total of 32 weeks during the academic year at Northeast Presbyterian Church. ETV StreamlineSC is an exciting, free resource that brings standards­-based digital video to every K­12 classroom in South Carolina (including home schools!). The content originates from Learn360, who has an existing library of more than 38,000 video clips, 11,000 full videos, and over 103,000 assets. There is also South Carolina content from ETV and ITV. In addition to video, schools have access to a high­ resolution image library; quiz, assignment and writing prompt builders; black line masters and teachers’ guides; and a calendar of events that ties video and image content to important dates in history. ETV, partnering with the State Department of Education and the K­12 Technology Initiative, provides this service FREE to all public, private and home schools in South Carolina. Created by ETV for K-12 students, teachers, and parents, Knowitall.org is a free online collection of resources designed for classroom use. This educational web portal contains interactive sites, simulations, image collections, virtual field trips and streaming video that support and provide quality inquiry-based experiences for students on the Internet. Has a FABULOUS children's library on the lower level at the main branch! The bi-monthly ACCESS magazine (available at your local branch) lists numerous free classes and events for all ages. Blue Star Museums is a collaboration among the National Endowment for the Arts, Blue Star Families, the Department of Defense, and more than 2,000 museums across America to offer free admission to the nation’s active-duty military personnel and their families, including National Guard and Reserve, from Memorial Day, May 30, 2016 through Labor Day, September 5, 2016. The Columbia Fire Museum celebrates the rich history of South Carolina's largest fire department. Located downtown at Fire Department's headquarters, 1800 Laurel Street, it is near the historic Robert Mills House, Hampton Preston Mansion, and Woodrow Wilson's boyhood home. Some of the artifacts date to the mid-1800's and include antique fire fighting equipment, an interactive exhibit, a photo history of fire fighting in Columbia. The Columbia Museum of Art's Interactive Education Gallery is a family friendly destination. It is always FREE and has several fun activities for parents to do with their children that relates to the student work being exhibited. Come get your Passport to Art! This year-round program for families features a new hands-on art project each month. After spending time in our open studios, explore our galleries at your own leisure or join us for the Family Tour at 1:00 p.m. Held the second Sunday of the month from 12:00 p.m. until 3:00 p.m.
Gladys' Gang - Join us for this exciting new series! Participants (ages 2-5) and their adult companions explore art through the introduction of elementary art terms such as color, line, shape and texture. This FREE monthly program includes a gallery visit, story time and a creative studio activity. The Museum's education programs are recognized for their curriculum-based approach. The Museum is a resource where people of all ages and backgrounds can come for enrichment, inspiration and learning. Interactive gallery tours based on the Museum's art collection or temporary exhibitions can be combined with hands-on creative projects in the studios. Each visit brings your students new discovery and we look forward to seeing you and your students! All school groups, including self-guided groups, must have a reservation. School Group Tour pricing is only available during the week (Tuesday through Friday). ​Homeschool Days at the CMA is designed especially for home-schooled children ages 4 and up and their parents. This program combines an exploration of the galleries and a studio project. Each child is $5.00. Register early as enrollment is limited! Pre-registration is required for all programs. On the first Friday of each month, we offer informal, experiential, hands-on education specialized for homeschool students. Come enjoy our programs on-site here in one of Columbia's biggest and brightest classrooms. Perfect for ages 3-12, this programming gives your students a chance to enjoy EdVenture in a whole new way! Enjoy EdVenture-led special activities on the first Friday of each month from 2:30 – 3:30pm. Homeschool groups receive a discounted rate: $8 per child with free admission for one parent/guardian; $5 for each additional parent/guardian. Also offers winter, spring break and summer camps. The vision of Generation Joshua is to assist parents in raising up the next generation of Christian leaders and citizens equipped to influence the political process today and tomorrow. Generation Joshua is a division of HSLDA (www.hslda.org). The vision of Generation Joshua is to assist parents in raising up the next generation of Christian leaders and citizens equipped to influence the political process today and tomorrow. Early Adventures Programs - Yearly programs require reservations and a minimum of 10 participants. They include a story, 1-2 crafts, 1-2 games, a mini-tour (1-2 rooms) and a snack. Programs are designed for ages 3-5 or 6-8, last approximately 1 hour and can be scheduled at any time during the year. For more information or to register your group, contact us at 803.252.1770 x 33 or sblackwell@historiccolumbia.org. McKissick Museum is located at the heart of the historic Horseshoe on the Columbia campus of the University of South Carolina. It was established in 1976 by the University Board of Trustees to bring together under one roof the many object collections housed in various departments and colleges across campus. These collections date to 1801 and provide insight into the long and illustrious history of the University. Free admission. 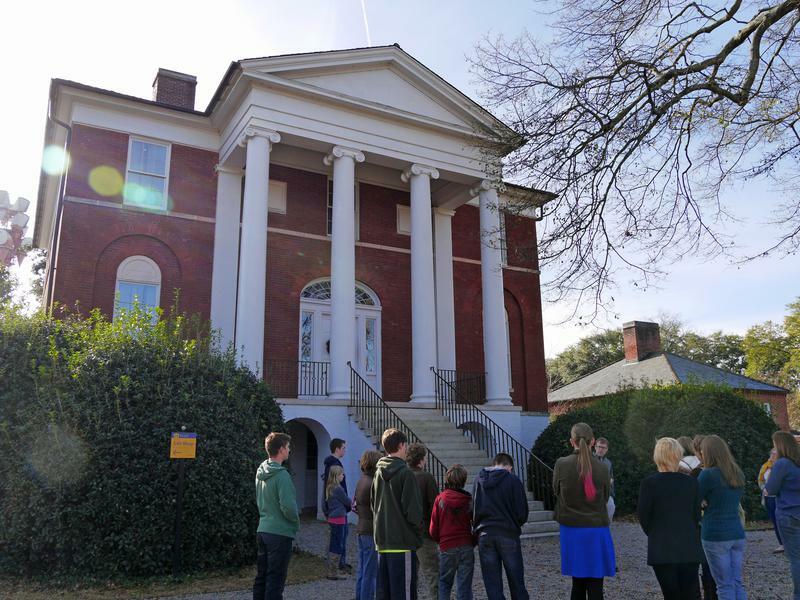 The second Friday of each month is Homeschool Friday at the SC Confederate Relic Room and Military. Sessions are at 10:00AM and 11:00AM (the same lesson is taught both hours) and last approximately one hour each. The programs are geared toward students of all ages and include lectures and activities. Topics for this school year's sessions are listed below, along with a printer-friendly version. This year’s Homeschool Fridays will each focus on the life of a great American. Some are local, some national figures; most span more than one conflict, and all provide valuable insights into historical events and lessons for our daily lives. To aid in planning, we ask that you register for Homeschool Fridays. But what do we know about the real world of Law Enforcement? What are their day-to-day duties? How are they organized? How has Law Enforcement evolved over the years? The answers to these and hundreds of other questions can be found at The South Carolina Law Enforcement Officers Hall of Fame. Visitors can experience the history of South Carolina law enforcement up close, and have the chance to see historic equipment, seized contraband, weapons, badges and uniforms, even a restored 1955 Ford SC Highway Patrol car! The South Carolina Law Enforcement Officers Hall of Fame was established by legislative act in 1974, with a primary purpose of honoring those South Carolina law enforcement officers who have died in the line of duty. Located in the capital city of Columbia, the South Carolina Military Museum is one of the largest and premiere National Guard museums in the country. It's mission is to honor and chronicle the South Carolina citizen soldier and this State's martial tradition from its colonial founding in 1670 to present-day operations worldwide. Featuring an impressive collection of artifacts, displays and exhibits, the Museum tells the story of the South Carolina militia, its evolution into the National Guard, and its important role today as a force multiplier for the United States Army and Air Force. The American Revolution officially began on April 19, 1775, when shots were fired at Lexington and Concord, Massachusetts. The first Revolutionary War fighting south of New England occurred at Ninety Six, South Carolina, in November 1775, while the longest siege of the revolution took place there nearly six years later in May 1781. The Battle of Kings Mountain, often referred to as the turning point of the American Revolution, took place in October 1780 and ended in Patriot victory. The Battle of Cowpens, during which Patriot forces employed a successful double envelopment strategy to surround British soldiers on all sides, transpired just three months later in January 1781. All three battles took place in South Carolina, and the history and resources associated with them are preserved within three national parks: Ninety Six National Historic Site, Kings Mountain National Military Park, and Cowpens National Battlefield. NPCA’s Center for State of the Parks used established, peer-reviewed methodologies to systematically rate conditions of cultural resources (e.g., historic structures, museum collections, archaeological resources) at all three parks. Natural resources were also assessed at Kings Mountain, but not at Ninety Six or Cowpens, due to a lack of information. Three separate reports, one for each park, detail the condition of park resources, challenges park staff face when caring for resources, and successful programs and strategies in place to ensure park resources are preserved into the future. The State House is located at 1100 Gervais Street, which is at the intersection of Gervais and Main Streets, Columbia, South Carolina. Guided tours are available free-of-charge. Each tour is preceded with the viewing of a 15 minute DVD on the history and architecture of the State House. Reservations for groups are recommended. The South Carolina State Museum offers the perfect destination for homeschoolers with four floors devoted to South Carolina history, art, natural history and science, plus planetarium shows and 4D theater films. General admission allows museum guests entry into all four floors of permanant exhibit space but does not include entry into the blockbuster exhibit, planetarium shows or 4D theater films. http://scmuseum.org/calendar/first-citizens-first-sunday/ - General admission to the South Carolina State Museum is only $1 for guests on First Citizens First Sunday! Included in general admission, guests can explore four floors of South Carolina art, cultural history, natural history and science/technology, including the brand new observatory and the new Robert B. Arial Collection of Historical Astronomy located on the fourth floor. For an additional price, guests can experience the museum’s new planetarium and 4D theater, as well as the current exhibit. Our mission is to be a youth string orchestra accessible to home school and community students, to sharpen and grown talents of student sin the area of strings, and through relationships and performances, to reach out to the community growing bonds of friendship though music and for the purpose of glorifying God. Greater Columbia Children's Choir offers superb musical instruction and provides Columbia's brightest and best students with performing opportunities of great music. In working together toward excellence, we find the journey fun and we make great friends in the process. If you love to sing and want to be a good musician, GCCC has a choir for you, whether you are in the 1st grade or the 12th grade! The Midlands Home School Band (MHSB) is a music program offered to home school and private school students in the Midlands of South Carolina. MHSB provides an excellent group band instruction from beginner to experienced levels in a nurturing environment. We strive to develop the student’s musical skill and appreciation as a means to glorify God. Research has shown that children can build a musical vocabulary in the same way that they learn to use language - through listening first, imitating next, and then creating and expressing their own ideas using the "vocabulary" they have absorbed. Through movement, silly songs and games, we will introduce children to many different rhythmic sounds and tonal sounds that will become part of their music vocabulary. It is our belief at the Worship Arts Center at Shandon that these beginning musical skills can be used for worshipping through song and dance! Join us as we explore our gifts and begin using them for the Lord! Music Play is for children and parents or caregivers to attend together! Take the music home and enjoy sweet moments of learning together. Classes are offered for children from birth-4 years old. We offer opportunities for musicians and artists of all ages and levels of experience. Join us as we explore and develop our God-given talents in a safe, Christian environment through private instruction, group classes, Children’s and Student Choir. The USC String Project provides instruction in violin, viola, cello and bass through group classes and orchestras. The nationally recognized program offers beginning classes for children in 3rd through 5th grade as well as beginning classes for adults. Continuing students can receive private lessons and play in String Project orchestras through high school. Teachers are undergraduate and graduate students supervised by USC faculty members. Camp Google is a free camp for kids, full of fun science activities and adventures led by experts. Everyone is welcome, and you can jump in anytime. We're on a mission to provide a free world class education for anyone, anywhere. Join us! Take a field trip today! You'll find that math can be used to answer many of the world's questions — from how to figure out an earthquake's magnitude to the intricate process of building a guitar! Virtual Homeschool Group is a online Homeschool Coop, that offers free classes to students. VirtualSC is a free state-sponsored online program serving students currently attending public, private and home schools in grades 7-12 and Adult Education Programs. VirtualSC offers free rigorous online courses aligned to state standards that are developed and taught by highly qualified, SC licensed teachers. The American Red Cross offers a wide variety of training courses in first aid, CPR, AED, life guarding, swimming, babysitting, care giving, and other areas for both individuals and organizations. The Congressional Award is the United States Congress' award for young Americans. It is non-partisan, voluntary, and non-competitive. The program is open to all 14- to 23-year-olds. Participants earn Bronze, Silver and Gold Congressional Award Certificates and Bronze, Silver and Gold Congressional Award Medals. Each level involves setting goals in four program areas; Volunteer Public Service, Personal Development, Physical Fitness, and Expedition/Exploration. Earning the Award is a fun and interesting way to get more involved in something you already enjoy or something you'd like to try for the first time. You move at your own pace - on your own or with your friends. This is not an award for past accomplishments. Instead, you are honored for achieving your own challenging goals. Community service club for home schoolers. They usually meet once a month to do a service project. Offers personal enrichment classes, however, students must be at least 18 years of age. Microsoft product policy has defined a homeschool program or student as a qualified educational user. This allows NFS to provide academic products and discount laptops to homeschool families at the same price and with the same software as traditional public school facilities. Presently NFS supplies thousands of laptops to public schools and now we can do the same for homeschoolers. Each TeenPact program is marked by spiritual discipleship, student leadership, parental involvement and a commitment to excellence. Our loyal base of parent volunteers and student leaders keep the vision alive and growing as we continue to expand nationally. Founded in 1994 by Tim Echols, TeenPact currently offers classes in 39 states and counting. The Carolina Children’s Garden is a two-acre green oasis and teaching garden located in northeast Columbia on the Clemson University/Sandhill extension campus. The garden has twelve theme gardens where children explore, play, and learn in a natural environment of birds and butterflies along with storybook characters like Winnie the Pooh and Peter Rabbit. The mission of the garden is to inspire, educate, and motivate the community to use gardening as a tool to bring families in touch with nature and each other. Whether it's Thursday Night Dinghy Races, Summer Sailing Camps, or being part of the Junior Sailing Team, there is plenty for the young sailor to do at Columbia Sailing Club. The Junior Sailing Team travels the southeast to other sailing clubs to compete in Sunfish and Optimists regattas. The team is always looking for new people to join with or without owning your own boat. The Broad River diversion dam fish ladder is a structure designed to allow fish the opportunity to migrate upstream and continue their function as part of the river ecosystem. The fish ladder enables fish to pass around a barrier by swimming up a series of relatively low steps into the waters on the other side. The velocity of water falling over the steps has to be high enough to attract the fish to the ladder, but it cannot be so great as to wash fish back downstream or to exhaust them to the point where they cannot continue their journey upriver. The 627-acre preserve is loaded with history. Archaeologists have found tools, pottery, arrowheads, and other evidence that people have lived in and around the preserve for nearly 12,000 years. On adjacent property, earthworks still remain where Confederate soldiers dug in as General Sherman's troops headed to Columbia in 1865. Beginning in the early 1900s, clay was dug from the pits here for the Guignard Brickworks. The clay pits now form several ponds, home to all kinds of wildlife. Hikers can enjoy a loop though the woods which is several miles long and goes by many of the ponds and historic features. Alligators and Spanish Moss, which are not normally found in the midlands, may be seen here. We work to protect and improve water quality, wildlife habitat, and recreation on the Congaree, Lower Saluda and Lower Broad Rivers through advocacy, education and enforcement of environmental laws. Bounded along its northeastern edge by the Broad River, Harbison Environmental Education Forest encompasses 2,137 acres of forestland only nine miles from downtown Columbia. Its unique urban location makes Harbison one of the largest public greenspaces inside the city limits of a metropolitan area in the eastern United States. Over thirty one miles of roads and trails weave through the pine and hardwood forest, crossing wandering streams and descending through leafy glades to the Broad River. Wet weather may prompt the trails to be temporally closed. Harbison Environmental Education Forest's emphasis is on natural resource education, providing demonstrations of forestry practices as well as recreation. Visitors are encouraged to come, enjoy, and even volunteer to help with the development of this valuable urban forest. Seasonal ice skating located in Boyd Plaza at Main Street and Hampton Street. The Melton Observatory is currently open to the public on clear Monday nights beginning at 9:00 pm to 11:00 pm, weather permitting. Anyone is welcome to come by and observe the moon, planets, stars, star clusters, and more through our telescopes free of charge! For over 30 years, Midlands Astronomy Club, Inc. (MAC) has existed to further the general knowledge of Astronomy in the South Carolina area. This continuing goal is shared by our members, representing many walks of life. Our members have a great range of expertise, from beginner to advanced, with a few professionals. You could say that we are definitely a group of enthusiastic amateurs. No matter what degree of experience in Astronomy you have, I know that the members will welcome you, and be glad to share their knowledge and share your knowledge. Free Annual Pass for U.S. Military - Available to U.S. military members and dependents in the Army, Navy, Air Force, Marines and Coast Guard and also, Reserve and National Guard members. Tubing, canoeing, etc - Palmetto Outdoor is dedicated to the preservation of our rivers and forests. We promote cultural history and environmental awareness through river trips and interdisciplinary walking tours. Families with homeschooled children ages 5–13 can partake in hands-on learning experiences during the Zoo’s new Homeschool Programs, offered quarterly. Budding gardeners ages 8–13 can also become certified green thumbs in the Junior Master Gardener program for Homeschoolers. Mark your calendars for this year’s Homeschool Monday programs at Riverbanks Zoo and Garden! Beginning October 2014, we will offer a new class six times per year that will focus on a particular topic, include hands-on activities and feature live animal encounters or guided Zoo tours. Topics change monthly so you can visit again and again! Cost: $5 per participant. Includes staffing and materials. Note: If you are not a Riverbanks member, a general admission ticket will also be required. Junior Master Gardeners provides an opportunity for youth to interact and bond with nature through hands-on gardening, scientific experiments and arts. This session is held on Wednesdays beginning in September and meets every two weeks. Students complete certification for the entire program during this time. Participants are required to do a set number of group activities with the leaders, as well as individual activities each week on their own, in order to obtain certification. Level 1 (ages 7–9) explores insects, plant life, fruits and vegetables, design, and more. Cost: $175 per child. Includes handbook, T-shirt, and supplies. Outdoor Recreation and the Department of Natural Resources are offering free youth hunting trips for active military and their children. Emphasis on safe and ethical hunting, conservation and responsible use of our natural resources and character education. For more information contact Mark Smyers at 803-751-8707. Stunning forested mountains and towering waterfalls, blackwater rivers and scenic inland lakes, white sand beaches and ancient island shores, treasured American historic sites and priceless cultural treasures. With more than 80,000 acres of protected lands from the Blue Ridge Mountains to the sand dunes of the Atlantic, South Carolina State Parks protect some of the most inviting natural, cultural and recreational destinations in the US. At scenic State Parks, you’ll find the best boating, mountain biking, horseback riding, fishing, kayaking, canoeing and hiking in South Carolina. One of the original 13 Colonies, South Carolina’s significant contributions to American history are brought to life in historic parks throughout the state. A popular family, sporting and group vacation destination, South Carolina State Parks feature cabins and villas, campgrounds, picnic areas, meeting rooms and even equestrian stables. Join us at Sesquicentennial State Park for a Family Fishing Clinic! These clinics are led and sponsored by SC Dept. of Natural Resources (SCDNR) volunteers and staff who will teach you the basics of fishing, from knot tying to lure selection and casting. Learn the skills to catch your next trophy fish or just enjoy some time outdoors with this fun hobby. Spaces are limited so sign up today! The National Christian Forensics and Communications Association (NCFCA) believes that formal speech and debate can provide a means for homeschooled students to learn and exercise analytical and oratorical skills, addressing life issues from a biblical worldview in a manner that glorifies God. Stoa is a national High School and Junior High Speech and Debate organization serving the needs of privately educated, Christian Homeschooling families. Stoa exists to train Christian homeschooled youth in speech and debate to better communicate a Biblical world view. The mission of the Institute for Cultural Communicators is to equip Christians to shape the future through authentic leadership and cultural communication. Since its beginnings in 1997, ICC has grown from an annual Communicators for Christ tour into an organization offering a variety of programs, events and teaching materials designed to help all Christian students, from all educational backgrounds - public, private and home - become "cultural communicators"--people who can impact their culture through excellent communication of the truth. Our goal is to provide support and guidance to Christian schools, churches, and community education programs as together we train well-rounded communicators. Our goal is to provide support and guidance to Christian schools, churches, and community education programs as together we train well-rounded communicators. Meets every other Tuesday from 12:00-2:00 p.m. at the Youth Center on Chestnut Street. Offers homeschool classes for gymnastics out of Rockstar Cheer on Clemson Rd. on Wednesdays. April 10, 2015 @ 6:30 p.m. Kids run 12 miles in increments then finish the final 1.1 miles on race day to complete the Half Marathon! Ages 14 and under. Offers sports opportunities and camps. For 10 years, Plex's goal has been to promote healthy living through activity based programs. Our two indoor state of the art facilities offer a wide variety of activities that encourage families to come together and Get Moving! From soccer and lacrosse to ice hockey and roller skating, you will find an activity for every member of your family to enjoy! We compete against local area public, private, and home educated athletic teams. Participation on our teams is open to specifically home educated athletes but has expanded to include some private school students whose schools do not offer a sports program, and students who do charter or virtual schools. Athletes of all races and religious affiliations may be a part of PAC athletic teams as long as they meet the age and eligibility requirements for each sport. Our team mascot is the Panther. Our team colors are navy blue and white. Our sports teams are led by coaches with proven experience. These men and women must sign our Statement of Faith and be committed to developing a winning team comprised of young men and women with Christ-like character. South Carolina Midlands Volleyball Club is one of the best volleyball clubs in Columbia, South Carolina. We are an Elite Club for Juniors from 14-18. We also cater to boys and girls of all ages and levels. We have Performance, Region, and Kids Power teams. Housed at Plex Sandhills, the club brings the USA and AAU Club Volleyball experience to its members. South Carolina United FC offers soccer programs for boys and girls from 3-19 years of age, offering All Youth...All Soccer...All Levels. Through a congressional appropriation, The First Tee will provide life skills education and character development to children of men and women of the United States Armed Forces. Established in 1995, Upward Sports is the world’s largest Christian youth sports provider. Approximately half a million players at more than 2,000 churches in 47 states participate in camps, clinics, and leagues through Upward Sports’ Recreation Division. The Challenger Learning Center of Richland County School District One is an aeronautics and space-themed educational program designed to provide interactive learning experiences, integrating science and math curricula with information and technology. Through various simulations, scenarios, and activities we offer, students develop skills in decision making, teamwork, problem solving, and communication. Our mission is to create a scientifically literate population with the skills needed for success in the 21st century. Note: You can schedule your own home school field trips (go with a group of home school friends) but it's best to schedule these early (ie August) as schools fill the field trip slots up quickly when they start booking their events in late August/September). Our mission is to prepare students for the global economy by providing programs focused on Science, Technology, Engineering and Math (STEM). We offer Curriculum correlating to the following National Standards: Science (NSES), Technology and Engineering (ITEEA), and Mathematics (NCTM). 4-H Garnet Squadron Robotics is a 4-H club for students in Lexington and Richland Counties interested in robotics, science, and engineering. Working with mentors from the University of South Carolina College of Engineering and Computing, we participate in the FIRST Robotics Competition (grades 9-12) and FIRST LEGO League (grades 4-8), and we stage demonstrations in the area to spread the word about how rewarding careers in science and engineering can be! Our club currently competes as FRC team 4901 (Garnet Squadron Robotics) and FLL teams 18486 (Garnet Squadron Alfa). No experience with robotics or 4-H is necessary to join the club; 4-H annual dues are just $10 and include access to a number of other great clubs and activities should you desire. We'd love to have you work with us! IT-oLogy is advancing IT talent through educational and networking opportunities for teenagers, college students, educators and professionals. We do this through three main initiatives: promote IT (K-12 schools), teach IT (colleges and universities) and grow IT (professionals). ​*Note: Registration for the free Cyber Saturdays typically fills up within 24 hours, so be prepared to sign up when events are posted in the middle of the month. Each Blue Star Theatres participant is offering discounted or complimentary admission to all military personnel and their families, as well as veterans. Columbia Children’s Theatre is thrilled to offer specially discounted daytime performances of each of our mainstage productions just for school groups. All performances will be at our resident theatre at Richland Mall. Admission is only $5.00 per student*, this is one opportunity you can’t afford to miss! Participation in the arts encourages the development of creativity, critical thinking, motor, teamwork, math, language arts, and leadership skills that students can use throughout their lives. Join us this fall for age-specific classes taught by certified master teachers of theatre and/or professional working actors trained in theatre pedagogy. The Columbia Marionette Theatre has grown and established itself as a premiere children’s theatre in South Carolina. Our mission is to entertain and educate children and adults across the state of South Carolina through the long-standing tradition and artistry of puppetry. Shows are on Saturdays and the third Monday of each month. Tickets are $5. Children under 2 are free. General admission only. Field Trips - Thousands of students have had their very first live theatre experience at the Columbia Marionette Theatre. Field trips to our theatre are exciting, fulfilling and educational. Welcome to the enchanting world of puppetry! Marionette Mondays - Can't come on Saturday? We perform the show on the third Monday of every month at 10 a.m. See the show and get a backstage tour! Active-duty, Guard and Reserve service members and their spouses can attend retreats at The Cove at no cost to them. This includes program fee, lodging and meals. The Billy Graham Evangelistic Association is proud of you and other brave men and women in uniform, and we appreciate your service to our country. To show our thanks, we are pleased to offer full scholarships for active-duty military personnel and their spouses to attend a seminar at The Cove, located in Asheville, N.C.
Come renew your spirit through encouragement and sound biblical teaching from respected Christian speakers. You will also enjoy the quiet seclusion of our mountain retreat, complete with winding trails, relaxing rooms, and celebrated cuisine. Most importantly, you will have plenty of time and space to be alone with God. As a home school mom, I understand how frustrating it can be to "discover" educational opportunities (quickly) whenever and wherever we do a PCS move with the military. Knowing how helpful it would be to have an easy-access go-to listing of opportunities for Chaplain Captains Career Course (C4) families who are here for the short six-month stay at Fort Jackson, South Carolina, I have created this page of resources.